Last week, we released a web data connector (WDC) to the Star Wars API. 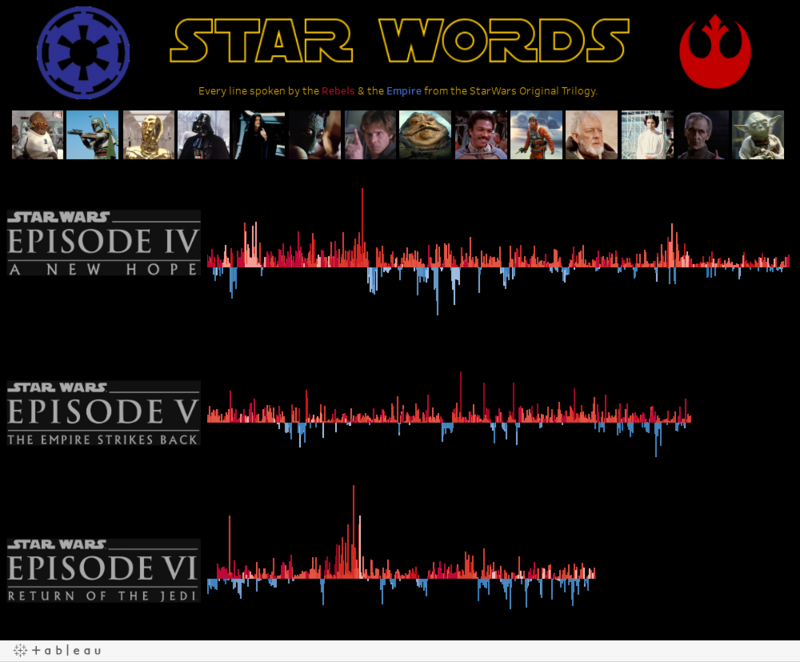 Judging from your Twitter conversations, we can tell there’s a lot of Star Wars excitement in the Tableau community! Today, we’d like to congratulate the fans (ourselves included) for enduring the long wait for Episode VII. 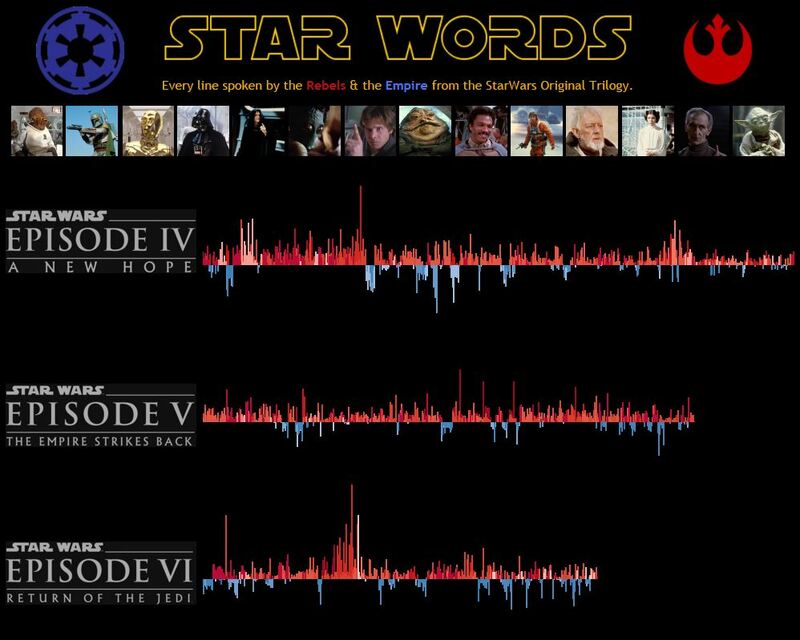 We’re excited to share ten awesome visualizations about Star Wars, including many that you created with the WDC in just the past week. 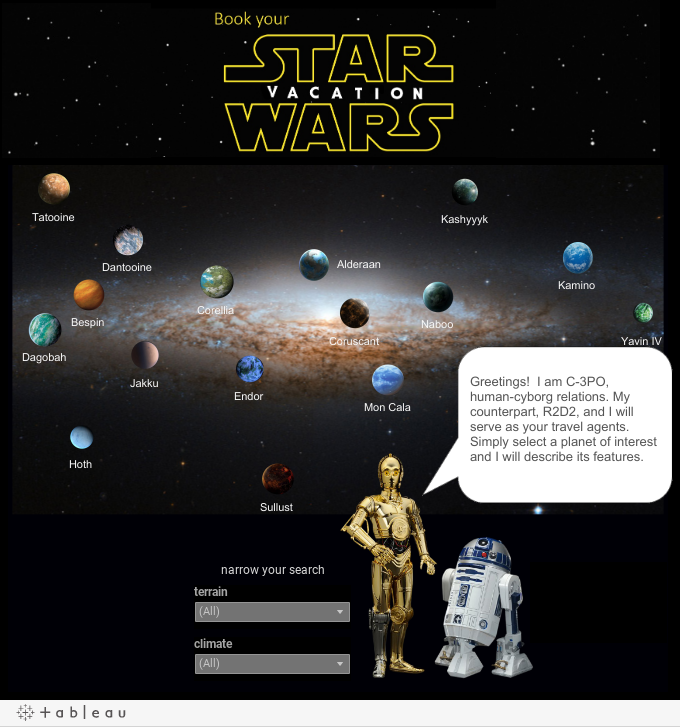 Book Your Star Wars Vacation: Need to take a vacation? Lucky for us, Joshua Milligan is now collaborating with C-3PO to help you make data-driven travel decisions. OK Chewie: Courtesy of Peter Gilks, you can now find your galactic love match. Go on, don’t you want to find out if Hans Solo is your soulmate? Welcome to Watto’s Shop: Props to Adam Crahen for this elegant and interactive design! Explore the—erm—interesting inventory of Tatooine’s notorious junk shop. 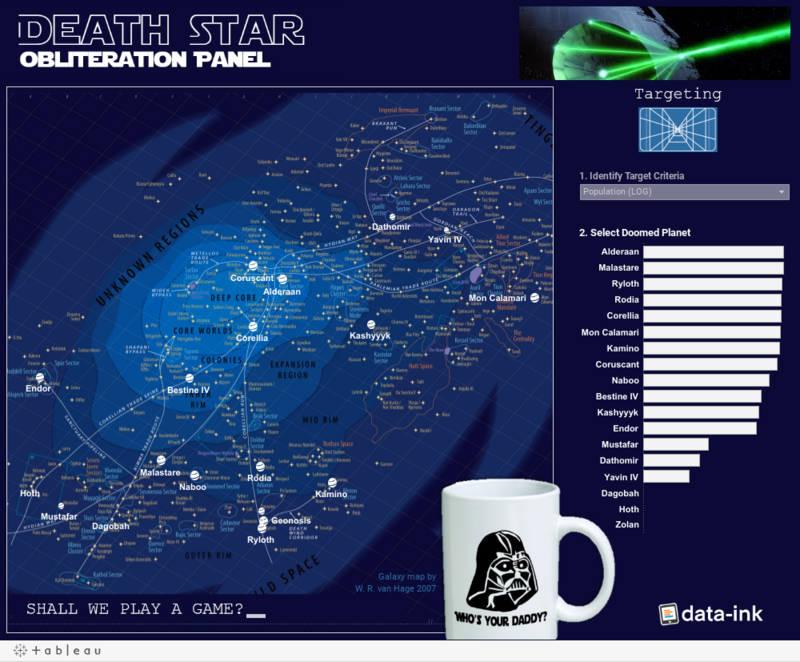 The Death Star Obliteration Panel: This morbid viz helps you search for civilizations to destroy in the Star Wars universe. Note the excellent use of custom maps and tooltips. jawaslist: Still using craigslist? Come on over to jawaslist—it’s what all the cool kids are using. Search the galaxy for a new vehicle that fits your budget. Just make sure to avoid the scams. 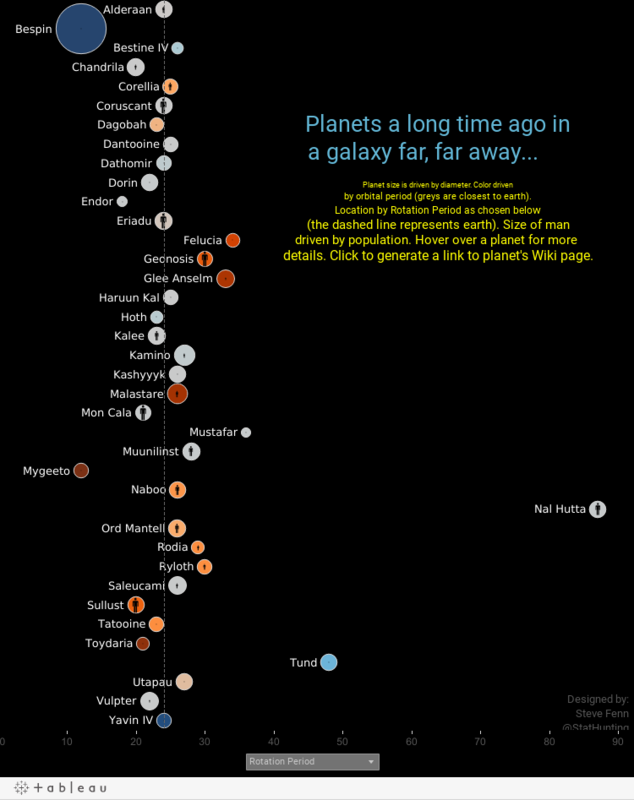 The Planets of Star Wars: Astronomy geeks will appreciate this look at the properties of Star Wars planets by Steve Fenn. Steve even lets us see how each planet compares to Earth. 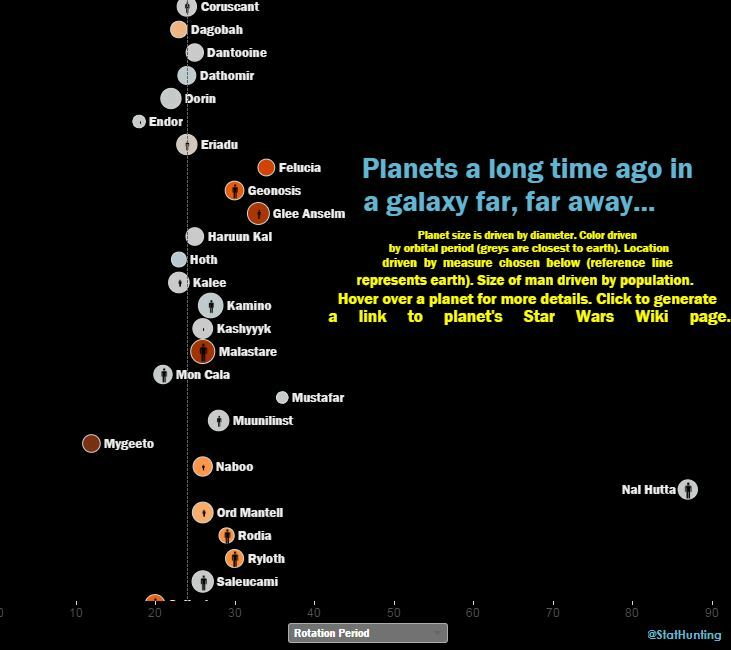 La Saga Original de Star Wars: Here’s yet another excellent viz from a different data source! See how the Peruvian newspaper El Comercio examines statistics from across the entire Star Wars saga. Star Words: And finally, Matt Francis breaks down every single line spoken by the rebels and the Empire in the original trilogy. Can’t say we’re not impressed. Of course, this is only the beginning of the data-geeky goodness that will come from The Force Awakens. 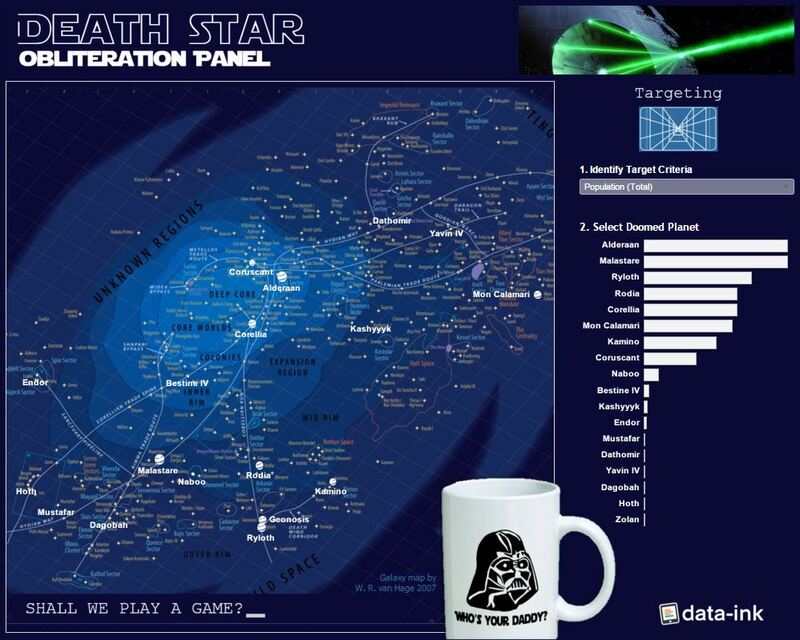 If you’re playing with any Star Wars data in Tableau Public or Vizable, please share what you build by using the hashtag #StarWarsData. Who knows where your viz might end up?